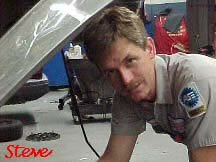 Steven D. Metcalf loves working on Honda's, so much so that he has opened his own shop to do nothing but that. He calls it "Dealer Alternative". "I've always been a car fanatic," says Metcalf, 35. "When my wife calls and asks what I'm doing, I say, `Playing with cars. How about you?'" Metcalf first became enraptured with Hondas after working at the Sears Auto Center at Ridgmar Mall. He and his wife were in the process of buying a new car, and Metcalf asked his fellow Sears mechanics to name the best car under $20,000. "Fourteen out of l4 experienced mechanics picked the Honda Accord," Metcalf says. "Typically; you're performing maintenance and not fixing stuff that was broken." It wasn't long before Metcalf decided that, if he were ever to leave Sear's, he wanted to work on Hondas and Acuras exclusively. Acura is the luxury car division of American Honda Motor Co.
Metcalf soon had his hand forced when Sears, his home for 10 years, decided ta scale back its repair operations. He took a buyout and landed at Mac Churchill Acura. After completing a training course in just six months, Metcalf earned certification as a Honda-Acura trained technician. He and his colleagues racked up company awards for service, and Metcalf was singled out in a national competition. In 1995, Honda began a nationwide total luxury care competition. By March of 1996, Metcalf had "won the whole deal." In typical Honda fashion, however, Metcalf notes that Honda declared that everyone else finished in second place. "Even in training, you work at your own pace," he says. "They don't want anyone to feel left behind." Several months later, Metcalf was offered the job of Honda service manager at Mac Churchill Honda. He initially declined, thinking that his next step, should it come, would be self-employment. But after discussing it with his wife, he decided to take the job so that he could gain more managerial experience. During his tenure, Mac Churchill won Honda's platinum level Partners in Excellence award. There are roughly 1,000 Honda dealers in the United States. Of those, only about 100 receive Partners in Excellerice recognition, and only 20 of those achieve platinum level. "I probably never would have quit there if I didn't have a desire to work for myself," Metcalf says. But on April 1, Metcalf gave his notice and rented a building on White Settlement Road. On April 15, he opened HondAmotive. Metcalf is building the business on a philosophy of providing service above and beyond what the customer expects. As an example, one customer brought in a 1989 Accord for scheduled 60,000-mile service. Even though it was not a part of the scheduled service, Metcalf fixed a broken door handle for the customer free of charge. "I'm trying to build the business," Metcalf says. "I want to build repeat business. I don't need that many customers, just a few who are loyal." As part of his effort to build such a client base, Metcalf says, he makes it a point to spend time with customers. He says he's not afraid for customers to be in the shop to see what he's doing, and believes that it is important to fully explain needed repairs to the customers. "A lot of mechanics will make women feel ignorant," he notes. "They'll say something like, `It just has to be done.' I want to thoroughly explain what needs to be done so they can understand." Count Karen Wenzel as a satisfied customer. "He does special things," she says. "He just goes above and beyond. He takes a lot of care and he's really super."